Legendary escape artist Harry Houdini is shown in chains in this photo circa 1899. STEVE EMBER: And I’m Steve Ember with the VOA Special English program PEOPLE IN AMERICA. Today we tell about Harry Houdini, the great escape artist and magician. BARBARA KLEIN: It was a hot July day in nineteen twelve. A huge crowd gathered near New York City’s East River. They were there to watch a man whose hands and legs had been locked together. The man was put into a wooden box on a tugboat near the riverbank. The box was nailed shut. Ropes were wrapped around the box. More than ninety kilograms of lead weight were put on top. The box was then lowered into the water. STEVE EMBER: Time seemed to go by slowly. The crowd was sure the man would soon be dead. But suddenly, there were bubbles in the water. The man swam to the surface, his arms and legs free. When the box was pulled to the surface, it was still nailed shut and the ropes were still wrapped around it. Scientific American magazine later wrote it was “one of the most remarkable tricks ever performed.” The man who had just escaped death was named Harry Houdini. 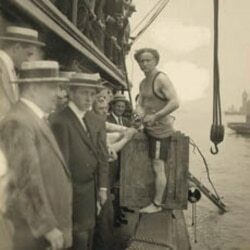 Harry Houdini prepares to be closed in the crate and lowered into the New York Harbor. BARBARA KLEIN: Harry Houdini’s real name was Ehrich Weisz. He was born in Budapest, Hungary in eighteen seventy-four. His father was a rabbi, a Jewish religious leader. His family moved to the United States two years later. Young Ehrich worked at many different jobs to help earn money for his poor family. But he really wanted to be in show business. STEVE EMBER: When he was nine years old, he performed a trapeze act on a swing high above the audience. He was “Ehrich, the Prince of the Air.” Then he read about a famous French magician named Jean Eugène Robert-Houdin. It changed his life. Erich took Houdin’s last name, changed the pronunciation and added and “i” at the end. He then began learning magic tricks, and called himself Harry Houdini. He took his act to many places in New York State. For a while, he worked in a traveling circus. 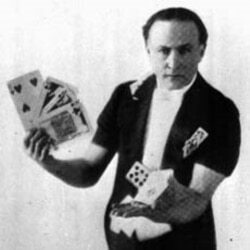 BARBARA KLEIN: At first, Houdini performed regular magic tricks, using cards, coins, and other objects that he would make disappear. But the audience seemed to like it best when Houdini performed an escape. He soon became famous for being able to free himself from danger. Most of the time, his wrists would be held together by handcuffs. Sometimes chains would be wrapped around his body and locked. At other times, he wore a straightjacket, like the kind used in mental hospitals to restrain patients. He once escaped from a straightjacket while hanging high in the air, upside down, from a crane. Houdini escaped from milk cans. He escaped from the strongest jails in the United States. No one ever found a pair of handcuffs that would hold him. STEVE EMBER: But Houdini’s most famous escape was called “The Chinese Water Torture.” First, his feet were locked together. Then he was lowered, upside down, into a glass box filled with water. A curtain was placed in front of the box so the audience could not see how the trick was done. BARBARA KLEIN: But, of course, he was not dying. Finally, the curtain would drop. Houdini would be standing next to the box, free and unharmed. Audiences around the world loved this trick so much, Houdini performed it for the rest of his career. STEVE EMBER: During Houdini’s lifetime, some people thought it was possible to talk with or somehow communicate with dead people. Houdini hoped this were true. He had loved his mother very much. After she died, he tried to talk with her spirit. But after years of trying, he realized that he was wasting his time. He decided that no one could talk with the dead. Magician Harry Houdini was also well known for his card tricks. BARBARA KLEIN: But many other people thought Houdini was wrong. They held meetings, or séances, to try to communicate with the “other world.” Usually, people would sit around a table in a darkened room and hold hands. They would close their eyes. The leader of the group, called a medium, would speak out and ask a spirit to come into the room. Sometimes they asked the spirit to speak to them, or to make some kind of sound. Often, the medium would charge money in order to try to contact the spirits. BARBARA KLEIN: Houdini was so sure that he was right, he offered ten thousand dollars to anyone who could prove he was wrong. No one ever collected the money. STEVE EMBER: Harry Houdini had a long career as a magician and an escape artist. He became the most famous magician in the world. He wrote books and acted in movies. He made a lot of money and lived well. He bought a small airplane and flew it himself. His name was always in the newspapers. It seemed the entire world knew the name of Harry Houdini. But Houdini would not live to see old age. His life ended suddenly in nineteen twenty-six. A group of celebrities pose in front of the star for legendary illusionist Harry Houdini on the Hollywood Walk of Fame. BARBARA KLEIN: Houdini was resting in a private room after giving a speech at McGill University in Montreal, Canada. He had not felt well for several days. A young college student asked to meet the great magician. Houdini agreed. The young man asked if it were true that Houdini would not be harmed even if hit very hard in the stomach. Houdini said that was true. The student drew back his fist and hit Houdini in the stomach three times. STEVE EMBER: Houdini had not had time to stiffen his stomach muscles. He fell backward in great pain. Doctors found that Houdini’s appendix had burst. In those days, this almost always caused death. Poisons had been released in Houdini’s body. He lived for a few more days. Then died on October thirty-first -- Halloween. Thousands of people came to New York City for Houdini’s funeral. He was buried next to his parents on Long Island. Under his head lay a pillow, filled with letters his mother had written to him. BARBARA KLEIN: But the story of Harry Houdini did not end there. He had said that no one could communicate with the dead. Yet he had told his wife, Bess, to try to speak with him after he passed into the spirit world. Harry told her two words that he would say to her so that she would not be fooled by some trick. Those words were, “Rosabelle, believe.” “Rosabelle” was the name of a song that Bess had sung many years before. No one but Houdini and his wife knew these secret words. STEVE EMBER: Bess tried to talk with Harry’s spirit each year on Halloween night. The years passed. Once, Bess said that she thought that one time she had made contact with Harry. But she then said she was wrong. She had been sick. She had heard nothing. Finally, after ten years of trying, something unexpected did happen. Bess gave up. She said that was long enough to wait for any man. BARBAR KLEIN: Then she blew out the candle. STEVE EMBER: This program was written by Jim Tedder and produced by Dana Demange. Jim Tedder was the voice of Harry Houdini. Faith Lapidus was the voice of his wife, Bess. I’m Steve Ember. BARBARA KLEIN: And I’m Barbara Klein. Our programs are online with transcripts and MP3 files at voaspecialenglish.com. And you can find us on Twitter, Facebook and YouTube at VOA Learning English. Join us again next week for PEOPLE IN AMERICA in VOA Special English.